While my kids are much healthier now that they're older and not in public school anymore we've been running a pretty ragged schedule around here lately and I think that has led, in part, to us all feeling a bit run down and miserable. My younger two boys are stuffed up, coughing, and even running low grade temps off and on. That's a sure sign that we need to spend a day or two at home resting and recouping. 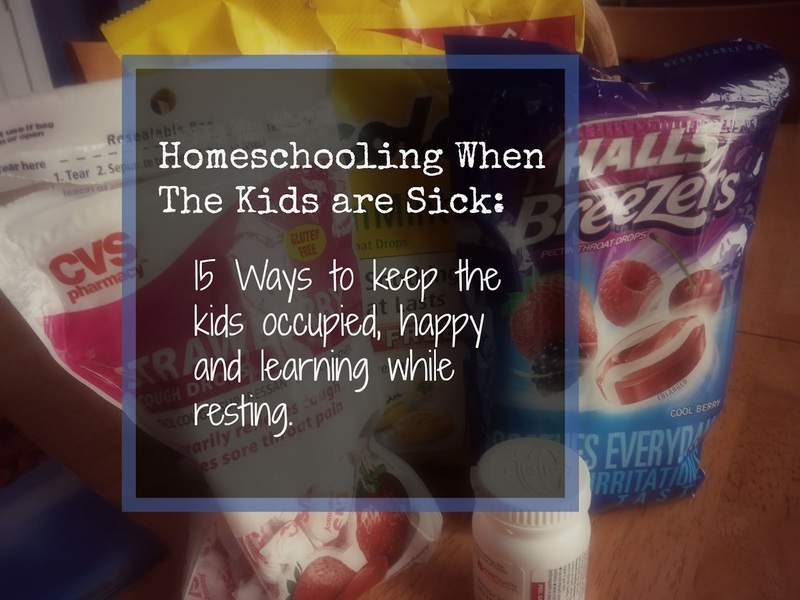 But, unlike most public school kids, my kids don't often get sick days. We may take a break from traditional work but there's still plenty of fun ways we can rest and learn. Movies! We love watching movies when we're under the weather and there are so many that are educational as well. Today, Ian watched Unbreakable; the true story of a US Olympian & World War II prisoner of War captive. TV! There are so many wonderful TV shows out there to teach the boys about science, history, reading/ pre-reading skills, etc. We've watched Feth! With Ruff Ruffman, Wild Kratts, Magic School Bus, and Liberty's kids. Reading! Even when my kids are not up to reading on their own they still enjoy listening to me reading. Today we read another chapter in Cracker! The Best Dog in Vietnam. I also sat with each boy for some quiet one on one time. Board Games! If my kids are feeling up to it we'll often play board games when they're resting. They don't require much moving and they have their favorites; I feel that most board games are educational in some way and encourage them to play. Other days, like today, we might come up with our own game to play. Today Evan and Alec played sight word memory. Video Games! My kids love video games and I do find that they learn a lot from playing. They are usually only allowed to play for a few hours each day but whenever someone is sick that rule is usually lifted and they're allowed more options. YouTube! My kids love to watch YouTube videos and so many of them are wonderfully educational. I absolutely allow them to watch videos during the day when they're under the weather; especially since they realized they could watch it on our TV through the Wii. Puzzles! Another great, quiet activity for the boys that encourages problem solving and logic. Lego Building! My kids love playing with their Lego sets. I'll often bring a few bins down to put on the coffee table so it's easily in reach if they're resting on the couch and they can play and build to their hearts content. Coloring! My kids have lots of coloring books and a sick day is a great time to pull them all out and let them create; if they're up for it. Silly Band Bracelets! My middle son in particular loves making silly band bracelets and since it's clean and quiet it's a perfect craft for him on days like today. Geoboards! They love our geoboards and since I don't often think to pull them out of the cabinet they don't get used all that much. But sit a kid on the couch with some elastics and a board and they'll happily set to work creating a masterpiece. Tangrams! We have a few Tangram sets and the boys enjoy trying to make all the different shapes from their books. There are many printable Tangram patterns too! Block Building! My boys generally enjoy building with our Magna tiles or our soft blocks and while they do sit on the floor they still don't have to run around or have much energy to participate in block building. Cards! My kids have just recently started enjoying card games beyond Go Fish! and we'll play card games to pass the time. We've even played multiplication or addition war for added math practice.